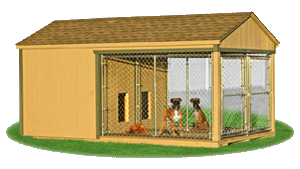 No matter the size of the dog we have a puppy palace to fit each and every one of man’s best friends. 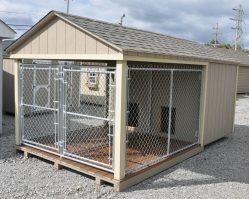 Like all structures we sell, you can have your dog box or kennel run customized to match your home, and the amenities desired. Give your animal the perfect home in just the right size, from a small dog box to a large double kennel. 1. Roof: 50-year architectural shingles, with your choice of 7 colors. 2. Siding: 50-year warranted LP Smart Side available in 23 colors. 3. 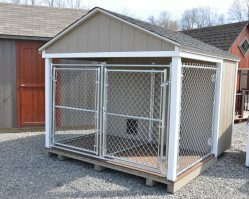 Covered Exterior Runs to keep your pets out of the hot sun and protect them. from rain and snow. 4. Chain Link Panels and Doors are professionally manufactured and welded.